For the first half of A Ghost Story I felt sure it was being haunted by the spectre of Chantal Akerman (1950-2015), the renowned Belgian avant-gardist who loved shooting in real time with minimal camera movement. After watching a static shot of Rooney Mara eating most of a pie I could definitely feel Akerman’s presence. Perhaps her movies were on David Lowery’s mind, along with those of other famously ‘slow’ directors such as Hou Hsiao-hsien, when he shot this strange, melancholy tale of a spook that hangs around a house watching the world change. To signify “ghost”, Lowery has opted for the Hallowe’en expedient of a sheet with two eyeholes. Beneath the drapery is Casey Affleck, who probably enjoyed the costume, given the acrimony his every appearance in Hollywood seems to generate. The film begins with Affleck and Rooney Mara as a couple living in a nondescript bungalow in an equally nondescript part of middle-America. He is never named, and she is referred to in a note as “M” (no James Bond references intended). He is a hairy Bohemian who writes songs, she has a day job which remains undisclosed. They have occasional disagreements, but seem to be in love, holding each other motionless for periods that will test viewers’ patience. Suddenly, he is dead. Killed in an accident. She looks at him lying on a table in the morgue, and pulls the sheet over his face. The camera remains on the sheeted figure after everyone leaves. Eventually he rises and wanders invisibly around the hospital. We understand this is our hero’s chance to take the great leap into the beyond, but he declines the invitation. Following the sign that says “Exit”, he leaves the hospital, trails his sheet back home, and stands around watching his grieving partner. For the rest of the movie he will be unable to tear himself away from this spot. At times he will get tetchy, make lights flicker, and even throw things around the room, but for the most part he stands in the corner, a silent observer of life in the house. Lowery has not made a horror movie but a meditation on the nature of time. Anyone who expects the standard shock-and-gore routine will be grievously disappointed. The real horror for this spectre is the ceaseless flow of days, weeks and years. Anchored to the spot, he watches people come and go. It may be that he experiences a truly transcendental case of boredom, or that his perception of time is completely different to that of living beings. Lowery leaves the door open. The ghost has moments of anger and frustration, but mostly it seems as if everything passes in the blink of an eye. The only break in the ghost’s lonely vigil is when he spies another sheeted figure at the window of the house across the street. In a telepathic communication the other ghost explains she is waiting for someone, but doesn’t remember who. Even ghosts, it seems, are prone to dementia. Nothing is spelt out in this story, but it appears the ghost cannot leave the earth while something in his previous life remains unresolved. This has to do with his relationship, but even after his former partner has left the house, he still remains. The ghost feels sorry for himself when a mother and two children move in and play happy families. When a guy at a party (played by musican, Will Oldham) drones on and on about the nature of life, the ghost manages to look just as glazed as the other listeners, even through his sheet. Eventually the house will be torn down, and we’ll see the sheeted figure moving through a construction site where a skyscraper is being built. He wanders invisibly through the completed building, from the boardroom to the rooftop, where we find that a semi-rural setting has given way to a neon metropolis. The next stage is to flip back in time, to watch a settler marking out the ground where the house will stand. Finally – and inevitably – he’s back in the room with himself and M.
These shifts in time are confusing after the doggedly slow pace of the early scenes, as Lowery asks more questions than he can answer. We are in no position to fault or correct his version of the afterlife, but up until this point the story had a certain plausiblity. As we speed towards a conclusion the metaphysics become increasingly mysterious. 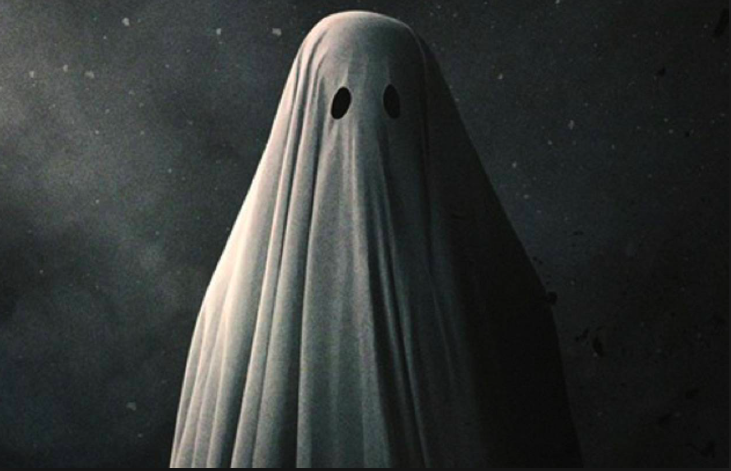 I feel bound to warn readers that A Ghost Story is one those films that will inspire ennui and frustration in some viewers, no matter how glowing the reviews. While I can respect the originality of Lowery’s idea, there is an arthouse self-consciousness that is constantly drawing attention to itself. This could be seen as a failure of narrative, or a willingness to rely too heavily on imagery and atmosphere. At the end of a long 92 minutes we have a pretty good idea of what it feels like to stand silently watching for all eternity.